To download Visual Studio 2015 Update 1, click on the download button. The files are downloaded from our free Dev Essentials subscription-based site. Please see the Dev Essentials page for information on our free comprehensive developer program and services. Developers using the Tools for Apache Cordova for the first time since the Visual Studio 2015 release will find a richer development platform with support for iOS 9, the groundwork for Android 6 “Marshmallow”, a new plug-in for Azure AD authentication and dozens...even hundreds of bug fixes to improve the developer experience. We also have a new destination for samples, tutorials and documentation, at http://taco.visualstudio.com. And now, docs are sourced directly from GitHub, making it possible for developers to contribute tips, tricks, and corrections by using a simple pull request. You can use Tools for Universal Windows Apps (v1.2) to build and submit apps to the Windows Store by targeting Windows 10 SDK Version 1511. Also included in this release are several developer productivity improvements to .NET Native, the XAML designer, the manifest designer, Windows Store packaging, and the debugger. We've also released scripting APIs that enable you to build and run C# as a script. The scripting APIs are available on GitHub. Additionally, we've released csi.exe, which is a tool that you can use to run a C# script file (.csx) from the Developer Command Prompt. For example, simply type csi myScript.csx to run your script file. 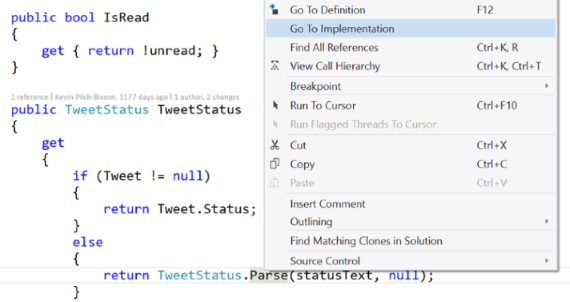 Or, you can enter the command-line REPL mode to interactively evaluate snippets of C# code. To get to this mode, run the command csi without any arguments from the Developer Command Prompt. In this release, we've added Edit and Continue support for /BigObj, which means that you can now Edit and Continue to edit code while debugging Windows Store C++ projects. The feature we've all been waiting for is finally here! You can now right-click on an interface or abstract method definition and navigate to its implementation by using the Go To Implementation shortcut. We've also added a new refactoring that lets you convert get methods to properties by using the Quick Action command, Ctrl + . Additionally, we've fixed bugs around formatting, unnecessary casting, WinForms integration, crashing when searching for a class in the Solution Explorer, and go to def/MAS with "Use Tabs." And, we've made regions now auto-collapse upon first open. 'Baseline' all current issues and "stay clean" moving forward. View and manage your baseline to audit suppressions, or to address existing technical debt. Remove duplicate instances of warnings in the error list to focus results to the unique set. We've made several improvements to the Events tab of the Diagnostic Tools window to help you read through and understand its list of events even faster and more efficiently than before. By category, by thread, or by using Just My Code. A new search control that allows you to search all visible columns of the Events table. Category prefixes** that we've added to all events, which makes them easier to read. 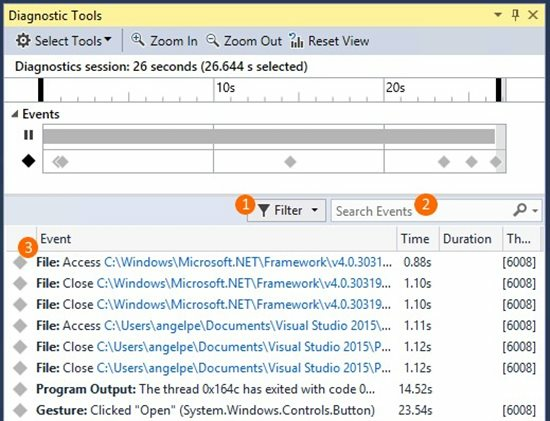 These Diagnostics Tools window improvements are available in all editions of Visual Studio. However, the following screenshot comes from Visual Studio Enterprise, which has IntelliTrace, and gives you access to more event categories than other editions. Learn more about the Diagnostics Tools window. For more information, read our " Profile Your CPU in the Debugger in Visual Studio 2015" blog post. Many other performance, stability, and reliability related fixes in RyuJIT, GC, WPF, and WCF. While Visual Studio 2015 Update 1 includes ASP.NET 5 Beta 8, we strongly encourage you to try the newly released ASP.NET 5 RC1 that is now available for download; for details, see ASP.NET 5 RC1 on this page. DNX Watcher allows developers who use the command line to experience the same edit and refresh browser experience that Visual Studio developers have been enjoying with ASP.NET 5 applications. DNX Watcher will watch the files in your project and show compilation errors if you have any. And as soon as your code can compile again, it will launch it and you can browse to your app. Localization. Application developers can now develop web applications that can be translated and used by many different cultures. Middleware is capable of setting a culture so that it is accessible through Thread.CurrentCulture, and APIs have been provided to read strings from resource files that can be selected based on current culture. One of the great things about the localization libraries is that the keys for your localized strings are the values in the default culture. So, for example, if you are writing an application in English, you can put English strings as the key names. Visual Studio 2015 Update 1 includes features from the 1.6 and 1.7 releases of the TypeScript tools. It brings significant enhancements to TypeScript's type system and enables support for the polymorphic type, intersection types, local type declarations, generic type aliasing, and user-defined type guard functions. It also completes ES6 support in TypeScript by adding ES6 Generators and ES6 Class expressions, and brings support for new ES7 feature proposals like ES7 Exponentiation operator and ES7 Async functions. Additionally, React's JSX is now natively supported by the TypeScript compiler and tooling. This release also enables targeting Node v4's native implementations of ES6 features (--target ES6) while using Node native module system (--module commonjs), apart from an enhanced support for node module path resolution. 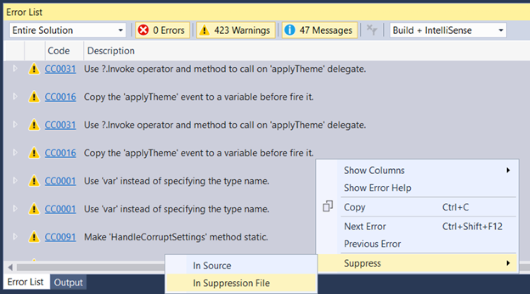 The Visual Studio Test Platform introduces support parallel execution of test cases. Parallel test execution leverages the available cores on the machine, and is realized by launching the test execution engine on each available core as a distinct process, and handing it a container (assembly, DLL, or relevant artifact containing the tests to execute), worth of tests to execute. The unit of scheduling is the test container. Within each container, the tests will be executed as per the semantics of the test framework. If there are many such containers, then as processes finish executing the tests within a container, they are handed the next available container. Parallel Test Execution is enabled using the MaxCpuCount setting in the global section of the .runsettings file (as shown in the following screenshot). ‘n’ (where 1 <= n <= number of cores) : upto ‘n’ processes will be launched. ‘n’ of any other value : The number of processes launched will be as many as the available cores on the machine. Parallel execution is supported through all launch points - CI, command line (CLI) and the IDE (Test Explorer, CodeLens, various “Run” commands, etc. ), and the Test Explorer indicators track the progress of tests executing in parallel. The Visual Studio Test Platform introduces support for MSTest framework-based tests for ASP.NET 5 applications. The MSTest framework components are available from the NuGet gallery. The Visual Studio Test Platform introduces support for CodeCoverage for ASP.NET 5 applications on the x86/x64 platforms that target the CoreCLR/CLR. We've also improved the Create Pull Request experience; now, users can publish branches and create pull requests in a single action. We now have a branch policy that requires associated work items for any pull request. Like the code reviewer and build policies, any code that is submitted to the branch must be submitted via pull request. When a pull request is created, the associated commits will be inspected for work item links, and if there is at least one link, the policy will be fulfilled. For a complete description of technology improvements, bug fixes, and known issues in this release, see the following MSDN article. For more information about ASP.NET RC1, see the " Announcing ASP.NET 5 Release Candidate 1" blog post. And to learn more about .NET Core and ASP.NET, see the " Announcing .NET Core and ASP.NET 5 RC" blog post. For more detailed information about this release and its new features and updates, see the " Announcing the Azure SDK 2.8 for .NET" blog post. Extensions "Ready to try now"
For detailed information and a download link, see the " Announcing Visual Studio Code Beta" blog post. To use this extension, you must have both Visual Studio 2015 Community or higher installed and the Visual C++ tools for Android or iOS installed. For more information, see the " Announcing the VS GDB Debugger extension" blog post. 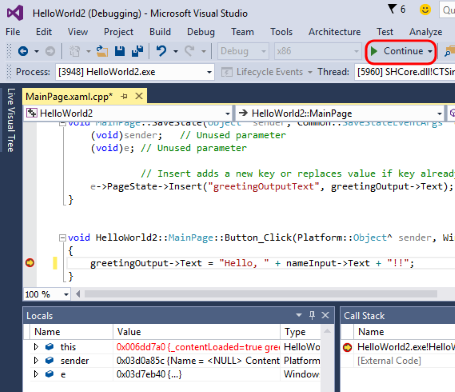 For more information, see the " Node.js Tools 1.1 for Visual Studio Released" blog post. The bundled version of the NuGet extension is 3.3. For more information about all the updates, see the NuGet 3.3 release notes. Action buttons that appear directly in the package list, which provides quicker access to common management functions. A user interface separated into a series of tabs, which are specific filters of the packages that you might work with in your projects. A Consolidate tab to use when you are working with the packages at the Solution level. It will also show a badge that indicates how many packages are candidates that you can update in projects. The NuGet tools now support significantly faster access to a specially crafted local folder store. To learn how to configure this repository, see the NuGet 3.3 release notes for detailed instructions.